Home CDN , children , crafts , feature , February , holiday , holidays , homeschool , papercrafts , printables , US , worldwide February 15th - Featuring Clifford The Big Red Dog Freebies! 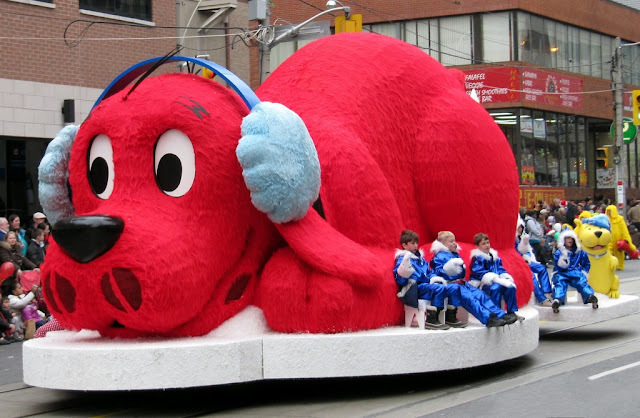 February 15th - Featuring Clifford The Big Red Dog Freebies! -- Meet Clifford and Emily Elizabeth in the original Clifford book! Clifford is big. Clifford is red. But most of all, Clifford knows how to BE A GOOD FRIEND. The BE BIG campaign invites everyone, big and small, to take action and raise awareness for how CLIFFORD'S BIG IDEAS can make the world a better place. • Standing Clifford Red Dog -- This large Clifford the Big Red Dog stuffed dog is ultra soft made with the utmost quality and detail from Douglas Toys. 16" standing. Surface washable. • Clifford® All Year Pack -- Cheerful, fun, and always endearing, these books about an enormous and sweet-natured pup celebrate the joy in everyday adventures. Includes Clifford Goes to Dog School; Clifford Takes a Trip; Clifford the Big Red Dog; Clifford, We Love You; Clifford's Birthday Party; Clifford's Christmas; Clifford's Day with Dad; Clifford's Family; Clifford's Halloween; Clifford's Happy Easter; Clifford's Happy Mother's Day; and Clifford's Thanksgiving Day Visit. - The new Canadian national flag was raised at Ottawa, Canada's capital, on February 15, 1965. The red-and-white flag with a red maple leaf in the center replaced the Red Ensign flag, which had the British Union Jack in the upper left-hand corner. - Honoring the popular, gelatin-based candy. Gumdrops have been a favorite candy for many decades. Nowadays, the Gummi candies which are the same gelatin base, are the most popular gumdrop type of sweet. Today you can eat Gumdrops to your heart's content! - A day for those who are unattached and without a significant other. It is celebrated the day after Valentine's Day. Valentine's Day celebrates love and romance for those currently in a relationship. However, if you are in between relationships, or without a significant other, you may feel left out. Valentine's Day can be a depressing day. So, the day after Valentine's Day is your day. - American battleship Maine was blown up while at anchor in Havana Harbor, at 9:40 PM, on February 15, 1898. The ship, under the command of Captain Charles G. Sigsbee, sank quickly, and 260 members of its crew were lost. Inflamed public opinion in the US ignored the lack of evidence to establish responsibility for the explosion. Remember the Maine became the war cry, and a formal declaration of war against Spain followed on April 25, 1898. - Honors one of the first women's rights advocates, working especially for the right to vote. Susan B. Anthony was born on February 15, 1820, at Adams, MA. - An ancient, possibly pre-Roman pastoral annual festival, observed in the city of Rome between February 13 and February 15, to avert evil spirits and purify the city, releasing health and fertility. Thought by some to have been established by Romulus and Remus, who, legend says, were suckled by a she-wolf at Lupercal (a cave in Palestine). Goats and dogs were sacrificed. Lupercalia celebration persisted until the fifth century of the Christian era. - J. Presper Eckert and John W. Mauchly demonstrated the Electronic Numerical Integrator and Computer (ENIAC) for the first time at the University of Pennsylvania on February 15, 1946. This was the first electronic digital computer. It occupied a room the size of a gymnasium and contained nearly 18,000 vacuum tubes. The army commissioned the computer to speed the calculation of firing tables for artillery. By the time the computer was ready, WWII was over. However, ENIAC prepared the way for future generations of computers.